In my Italian American family the term minestra was used to refer to soup or a soupy pasta dish. 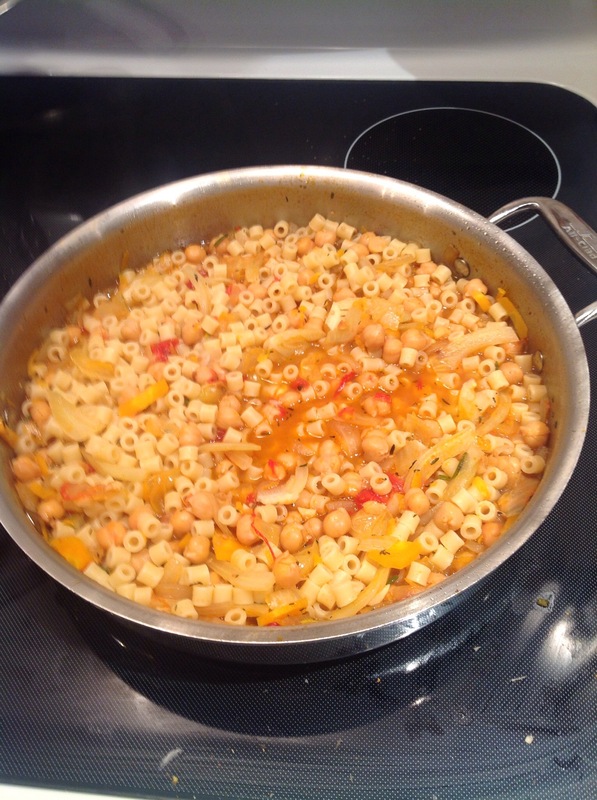 This recipe for chickpea minestra is a soupy version of pasta with chickpeas and is my favorite of the pasta with beans recipes that I have posted. It is a great dish for a cold day. Heat oil in a frying pan on medium heat. Add onions and cook 5 minutes or until onions are beginning to soften. Add fennel and garlic. Cook 3 minutes. Add grated carrot. Sauté 2 minutes. Add tomatoes, herbs, salt and pepper to taste. Cook 5 minutes. Add chicken stock and chickpeas. Cover and bring to a boil. Lower heat and simmer 15 minutes until the vegetables are tender. While the sauce is cooking, boil the ditalini. Add cooked pasta to the simmering sauce. It should be soupy. Serve with Parmesan cheese on the side. Serves 4.